With the EBP1000A active subwoofer the specialist EMPHASER launches a bandpass subwoofer model that boasts rich bass sound, very good max. dB output at very modest dimensions. Via several optimization runs and 3D software, the housing geometry has been optimized to provide a space-saving integration in the trunk. With dimensions of only 26 x 33 x 46 cm this active subwoofer is smaller than a good deal of 10"/25 cm ported bass-boxes. All the more impressive is the bass output of the EMPHASER bandpass unit, particularly in relation to the internal cabinet volume. Specifically, the typical bandppass pressure between 70 and 100 Hz can not be obtained with conventional ported systems. The additional output owes the EBP1000A its clever optimization of the chamber volume, where an adjacent Helmholz resonator ends in the horn like shaped opening: Any 12" ported box can only create more output in the lowest registers, while the "relatively small" EBP1000A overtakes from 70 Hz and on. 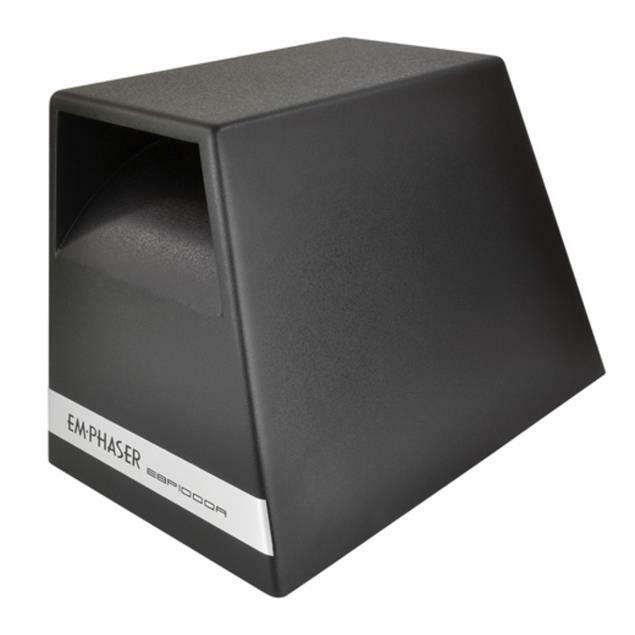 The EMPHASER active subwoofer builds upon the output of the sturdy 7 x 10"/18 x 25 cm driver inside the cabinet, featuring a 20 oz. (566.9 g) magnet and avery rigid cone. To power this system, a patented class-D circuit drives a very low impedance voice-coil (0.4 ohms) with over 150 W rms. The large diameter voice coil winding prevents overload of the woofer, while the overall efficiency of the amplifying circuitry protects the EBP1000A amp module against thermal overheating of the internal electronics. The EBP1000A offers a built-in 12 dB/oct. low-pass filter (50 to 200 Hz), to allow perfect system matching with existing factory or aftermarket speaker systems. Additionally, there is a bass boost control and a switchable phase shift (0°/180°). 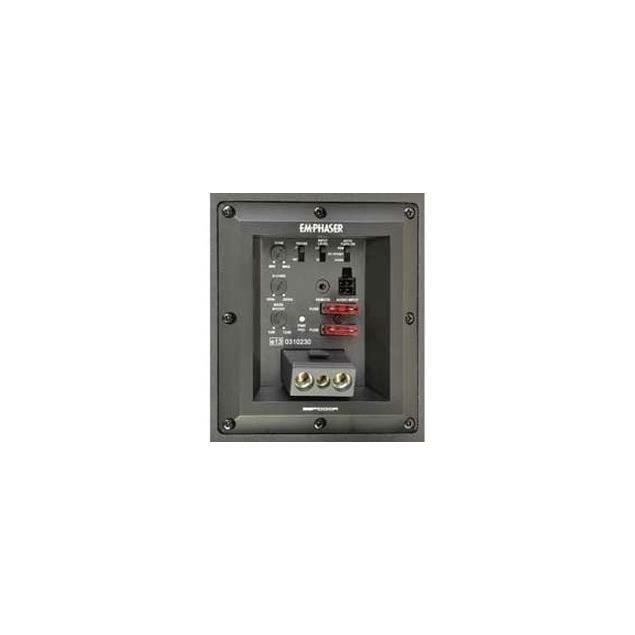 The high level input allows combination of the EBP1000A with factory radios that come without RCA line outs, where the auto turn-on function replaces the missing remote voltage by controlling the amp module power status via the music signal. 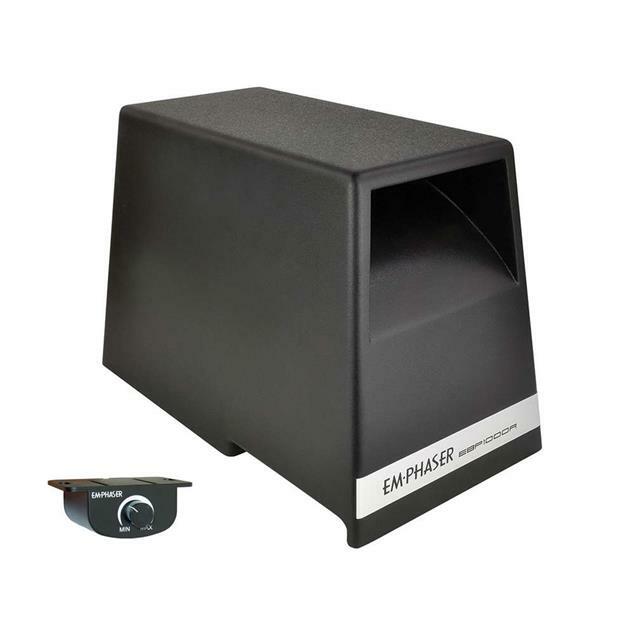 Because of the special cabinet shape, the EBP1000A is designed for placement on the left side in the trunk compartment. The power terminal is removable - so the EBP1000A can be unplugged in a second, which proves to be a very handy option when the entire trunk space is required. Since the amp model is mounted in the bottom of the cabinet all wires are fully concealed and totally out of the way. The EBP1000A leaves a great impression visually, also because the housing is painted with highly durable polyurethane speckle paint. Variabler Tiefpassfilter / Variable lowpass filter: 50 Hz – 200 Hz mit/with 12 dB/oct.